Wow, looking back on February it was quite the month! The calendar page turned over to February while was on my trip to Congo, during which my wife emailed to report that the snowdrifts across the street were as tall as the stop sign. While friends and family back home in Iowa were coming off one of the biggest storms all winter (and looking for the proverbial groundhog’s shadow as an indicator as to whether it would be the last), I was fortunate to be in the warmer Equatorial climate of Congo. Of course I was there to install satellite dishes and share the love of Christ, but the pleasant byproduct of escaping a few weeks of bitter Midwest winter can’t be denied. 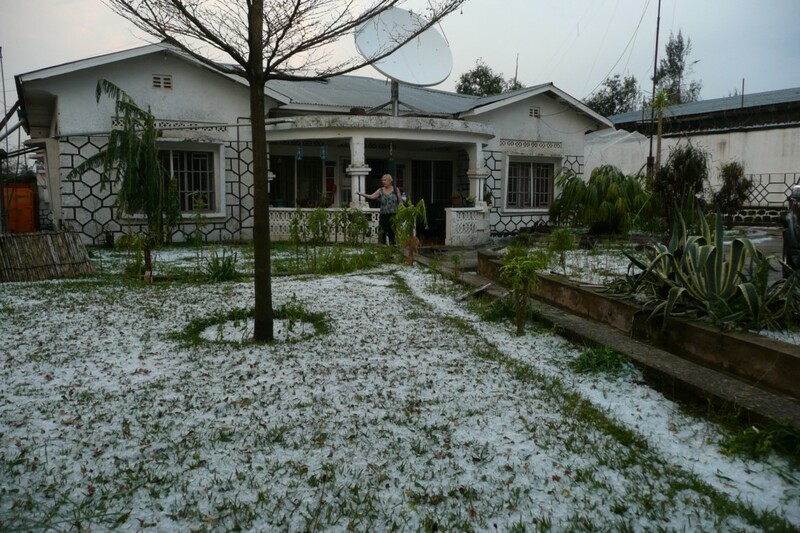 Shortly after I returned home however, I received word from the other MAF families in DRC that Bunia had a terrible hail storm. I guess my timing was just right! While I was gone Stephanie did a great job taking care of all three girl and dealing with all the challenges of being pregnant. She even did a five-minute preview of our ministry presentation at a church one Sunday. She’s an amazing woman! The month was atypical in that we had a church presentation or visit every weekend. Since we started our Ministry Partnership activities in August, we’ve had few church engagements outside the church where we grew up in Grinnell and our church in Ankeny. A lot more of our presentations have been to individuals or small groups. Many of the opportunities we pursued with referral churches just did not work out. In February we did several different types of church events including full presentations, setting up our MAF display table and visiting with people between services, an evening showing pictures from my trip, and a mission committee meeting. Overall the events seemed to generate good response, and we added about 30 people to our mailing list! As February closed, God also took us past another milestone as we saw our monthly support reach the 40% mark! We reached 30% in the first two months of support-raising, and over the last four months we have seen slow progress through the thirties. At times it has been discouraging, but we have learned many lessons in patience and trusting God in the progress. We’re thankful for everyone who is making this ministry possible through prayers and financial gifts! Our goal is to reach 100% on our support no later than this July, so we can leave for language school late in August. If you’d like more information about how to financially support our ministry with MAF, please see our Partnership page. Maybe we can reach 50% (or more!) by the end of the month! I’m excited as we begin March; it brings spring, my birthday, and hopefully continued opportunities to share our ministry and grow our team! Keep spreading those seeds Owen!